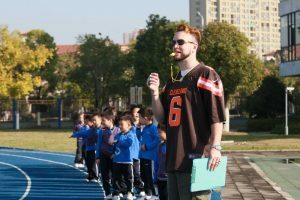 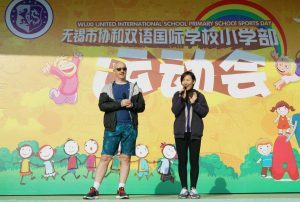 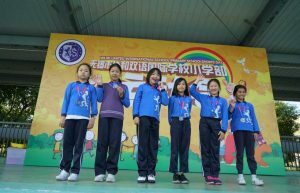 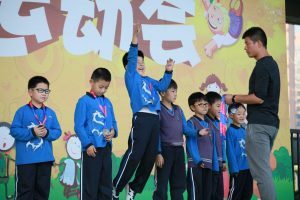 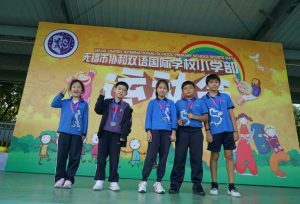 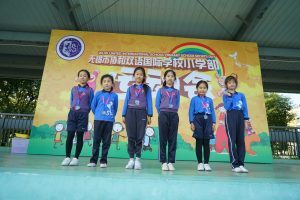 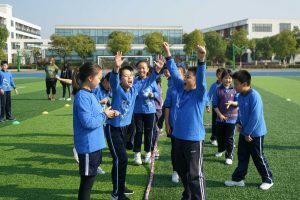 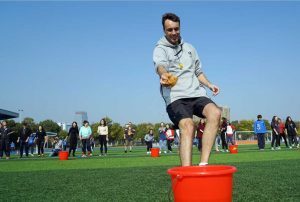 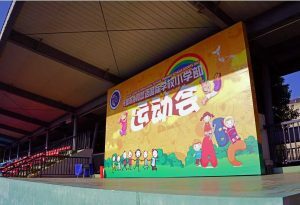 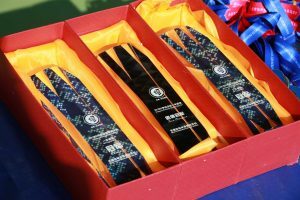 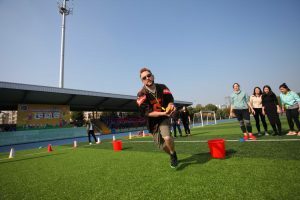 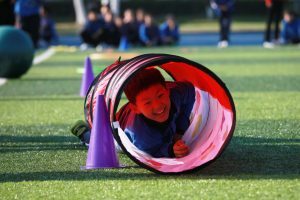 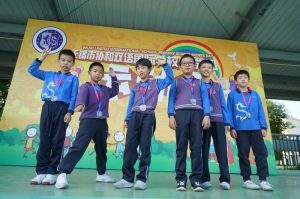 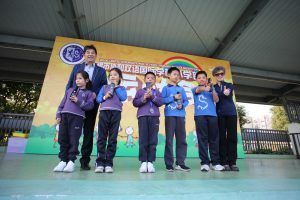 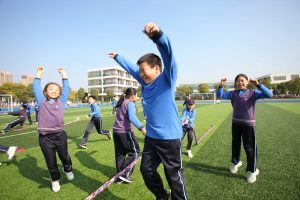 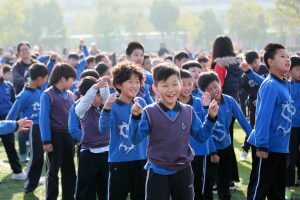 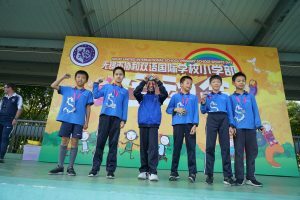 On Nov 9th, the annual sports meeting was held at Wuxi United International School. 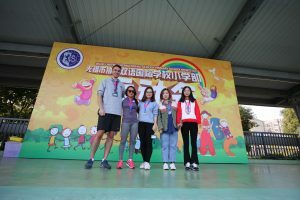 The weather turned sunny and lovable which was a big blessing because of the continuous cloudiness earlier that week. 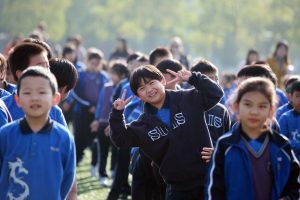 All teachers and students from Primary School headed for the playground right after 8:00 am. 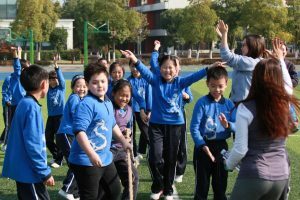 Accompanied by music, we first warmed up our bodies under the guidance of Mr. Barnard. 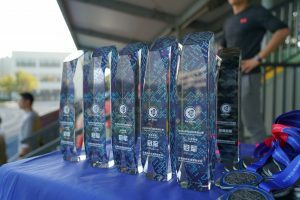 In the morning, there were four stations of competitions and each grade rotated among those stations within a specified time limit. 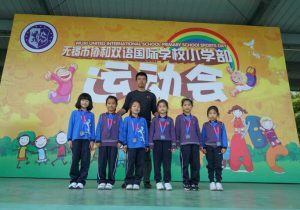 After the warm-up, all the grades went to their designated competition areas. 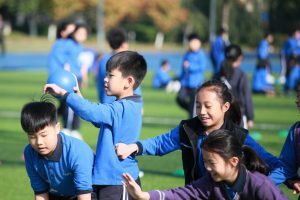 At Kangaroo Jump Station, students demonstrated their spring skill; at Obstacle Relay Station, students ran with a big ball in their hands, passed through a hula hoop and then jumped over a hurdle; at Jurassic Park Station, students were divided into groups of dinosaurs and scientists. 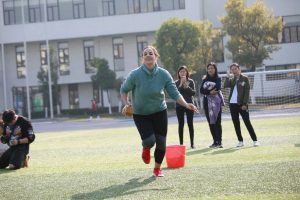 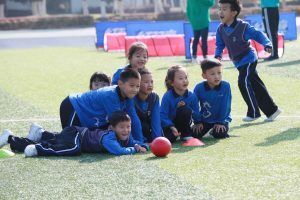 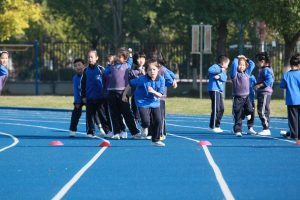 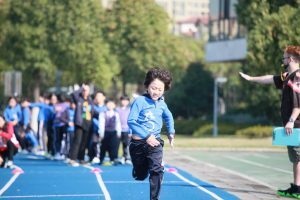 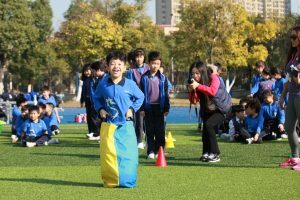 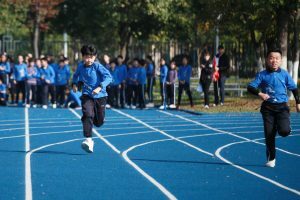 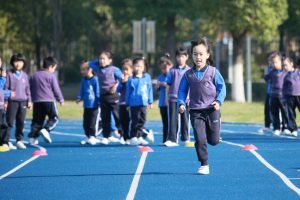 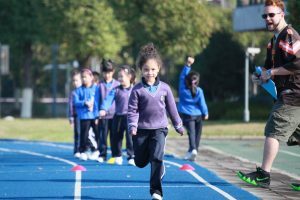 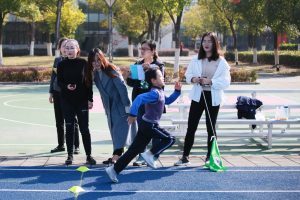 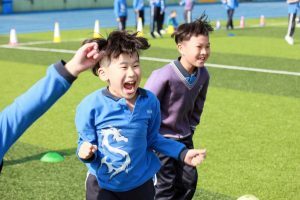 They needed to attack and defend according to their roles; on the track, students attended the 50M, and 100M sprint competitions and they were as fast as the wind! 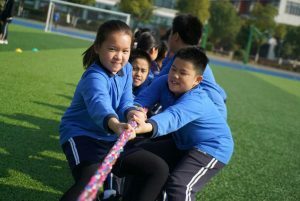 After lunch and a good rest, the stirring tug-of-war competition began! 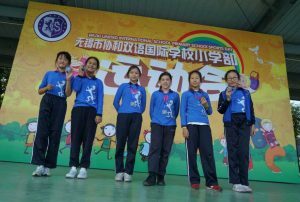 Each class appointed eight boys and eight girls to attend the competition which required some real teamwork! 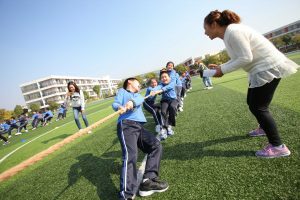 All the participators pulled the rope at full stretch so that the balance of victory would lean towards them. 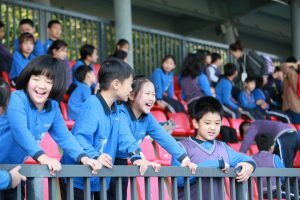 The audience on the bleachers tried so hard to cheer them up! 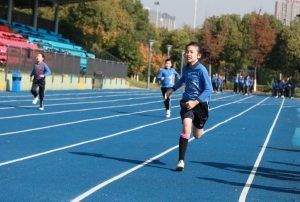 There is always victory and defeat in competitions, but what matters is the spirit of sport! 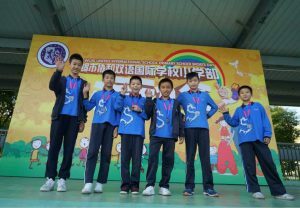 All participators consciously lined up and clapped their hands to show respect and gratitude to their opponents after the competition. 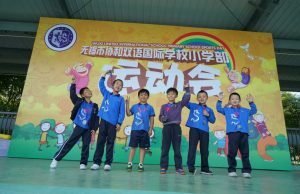 The fact that they’ve got cooperative awareness at such a young age is inspiring! 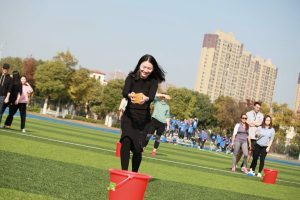 Teachers’ relay race came after the tug-of-war, and of course, it brought a lot of fun to both teachers and students. 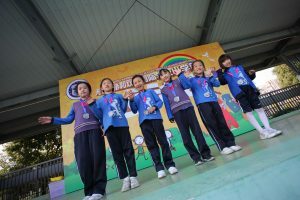 In the end, the school awarded medals and trophies to some of the best-performed students and classes. 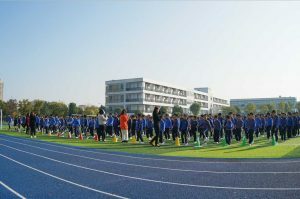 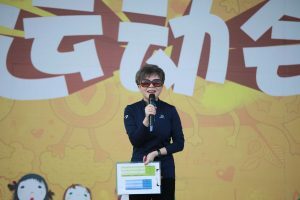 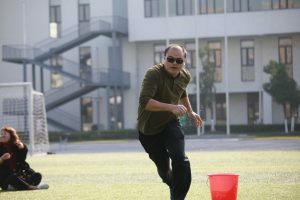 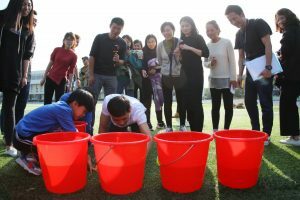 Students of WUIS, along with the blue sky and the green football field, composed the most beautiful scenery of that day. 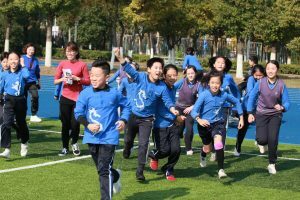 We sincerely look forward to seeing more cooperation and competition in the upcoming sports meeting!